Will Alsop has just unveiled his designs for Putney Place – a landmark mixed-used development opposite East Putney station in London, which aims to regenerate and revitalise this part of Putney. 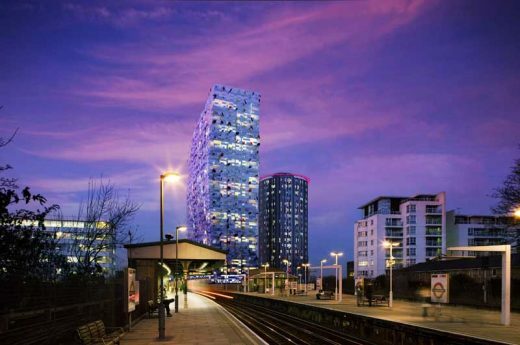 Commissioned by the Oracle Group, Alsop is currently undertaking an extensive public consultation process incorporating feedback from the local community into the outline proposals. A planning application is due to be submitted to Wandsworth Council later this year. The scheme comprises a 25-storey building (Putney Place 1) and a 19-storey building (Putney Place 2) which will provide a total of 330 new homes including 120 affordable residential units. 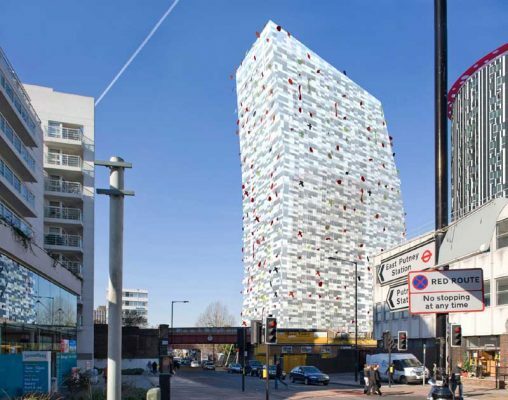 Putney Place 1 features mosaic-like cladding consisting of opaque white, translucent, and transparent glass panels. The building contains 210 apartments with private winter gardens and 700 sq metres of retail space and 1,600 sq metres of office accommodation. Apartments are planned internally to maximize the external glazed wall area to capture views out and maximize the amount of daylighting. The bathrooms will be pre-fabricated with factory-finished components and surfaces. Putney Place 2 is a dramatic cylindrical building, raised 7 metres from the ground on raked columns, which contains affordable apartments with winter gardens and a communal roof garden. Externally the building is predominately black, with white stripes, to compliment its simple yet bold shape and also to provide contrast with the white cladding at Putney Place 1. The quality of the public realm is central to the scheme – renowned artist Bruce McLean and Churchman landscape architects have been appointed to develop a dynamic new space which incorporates a central water feature with ground jets and a dedicated play space at ground floor level at Putney Place 1. 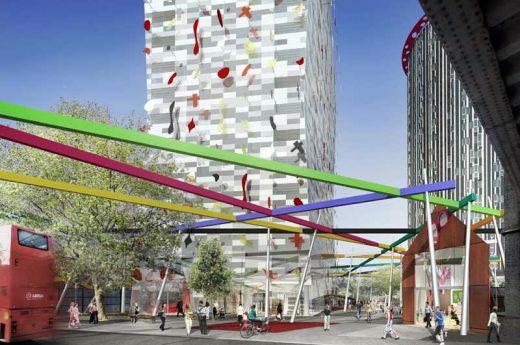 An innovative public art component will be a lattice of coloured beams suspended around 12 metres above ground, designed by Bruce McLean. Sustainability is also an integral part of the proposal which with a focus on passive design in addition to on-site renewable energy production. March 5, 2008 in London.